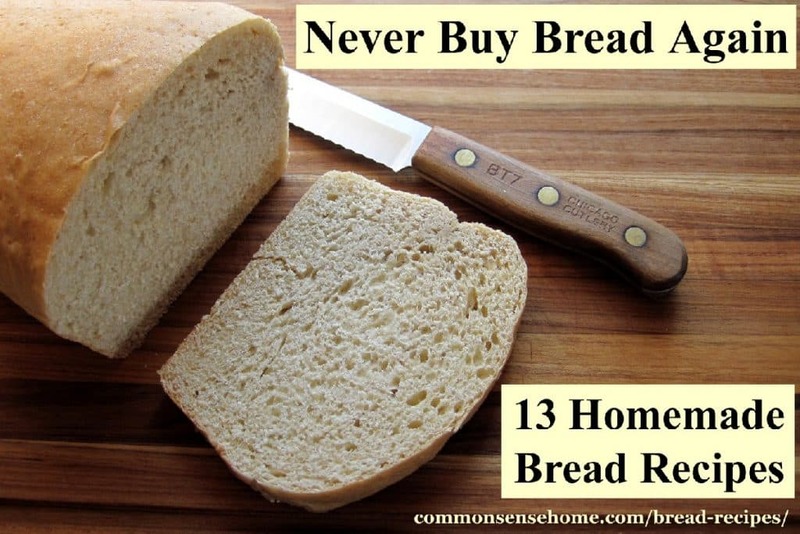 When I asked on the Common Sense Home Facebook page if people were interested in bread recipes, I got a resounding, “Yes!” So I've rounded up some of my favorite bread recipes, plus some from my friends, to give you enough options that you should never have to buy bread again. The first section has a number of yeast bread recipes using wheat flour, the second section has bread recipes for special diets including gluten free breads, a kombucha sourdough and a bread recipe that uses soaked or sprouted whole wheat flour. Ditch all the nasty ingredients in store breads, save yourself some money and enjoy some really good bread! Enjoy fresh baked bread? 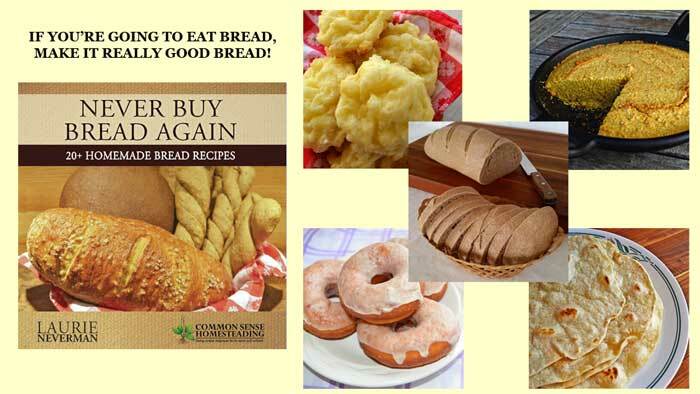 Click here to get my new book “Never Buy Bread Again” – NOW AVAILABLE in spiral bound print and digital version. Note: I use SAF-INSTANT yeast, which does not require proofing (activating the yeast in warm liquid). 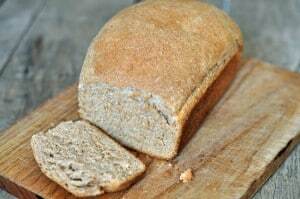 You can substitute bread machine yeast or active dry yeast. Active dry yeast will need to be dissolved in the warm liquid before adding the rest of the ingredients, and you will need a little bit more active dry yeast. For more on yeast substitutions, visit Yeast FAQ at The Fresh Loaf. 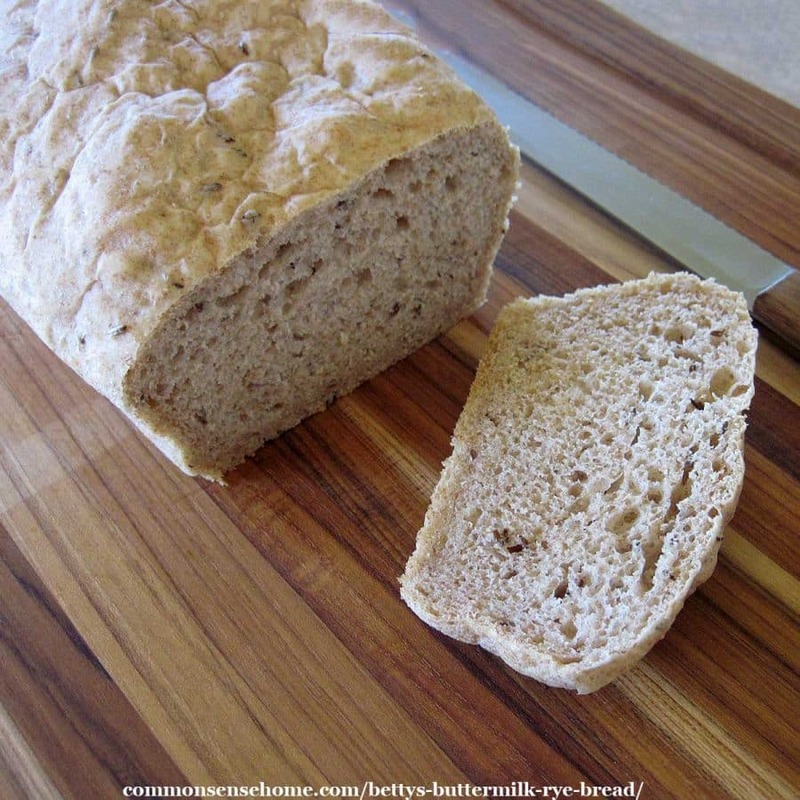 Our Favorite Bread Recipe – This easy bread has eggs and butter for extra richness. 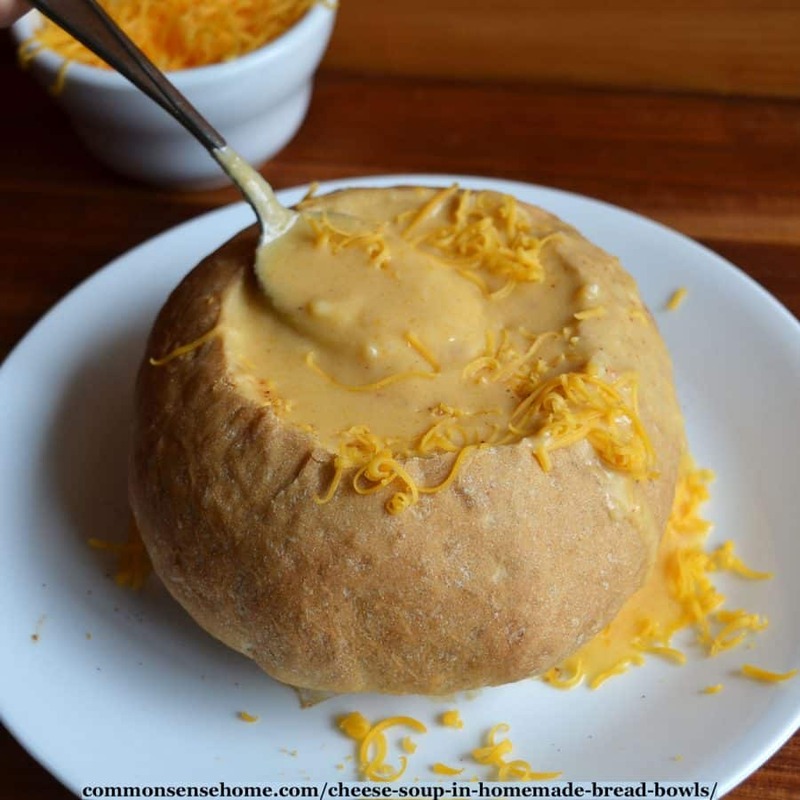 It's great as a sandwich bread or as buns for burgers, brats or sloppy joes. 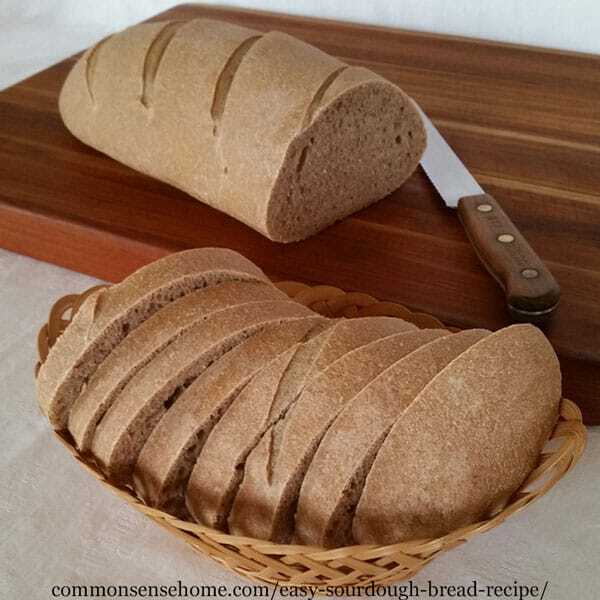 Easy Sourdough Bread – This simple sourdough recipe uses only four ingredients – sourdough starter, flour, water and salt. The post also includes how to create a sourdough starter. Potato Bread using Leftover Mashed Potatoes – If you happen to have less than a cup of mashed potatoes left over – not enough for another meal – give them a second life adding moistness to this light and tender sandwich bread. 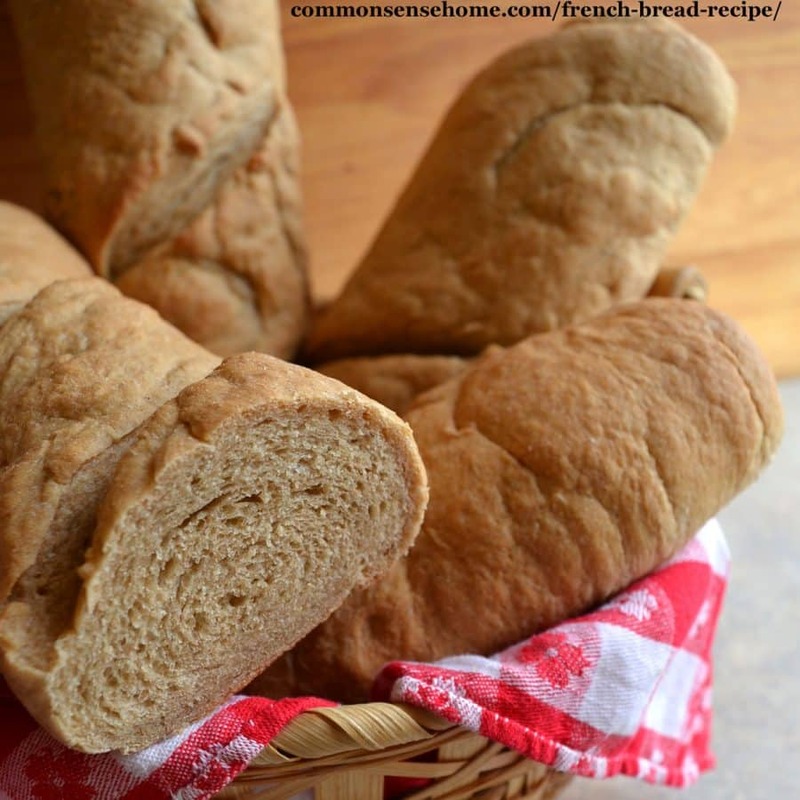 Crusty French Bread – This crusty French Bread recipe is great with soups and stews, as loaves, twists or bread bowls (see below). Best enjoyed fresh to preserve the crackly crust, but makes an excellent French toast if there are any leftovers. 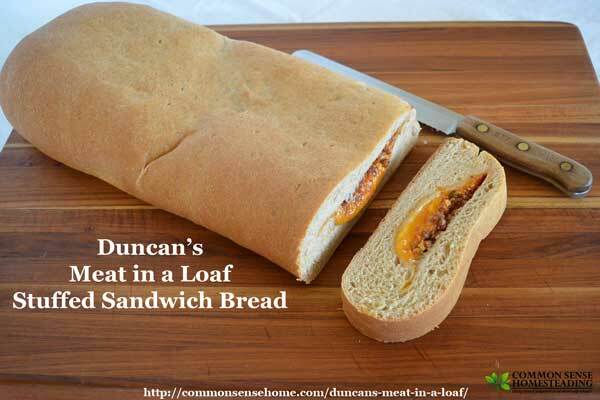 Duncan’s Meat in a Loaf – This is one of my youngest's favorites, bread and meat all in one. Makes a great hot sandwich option for feeding a crowd. 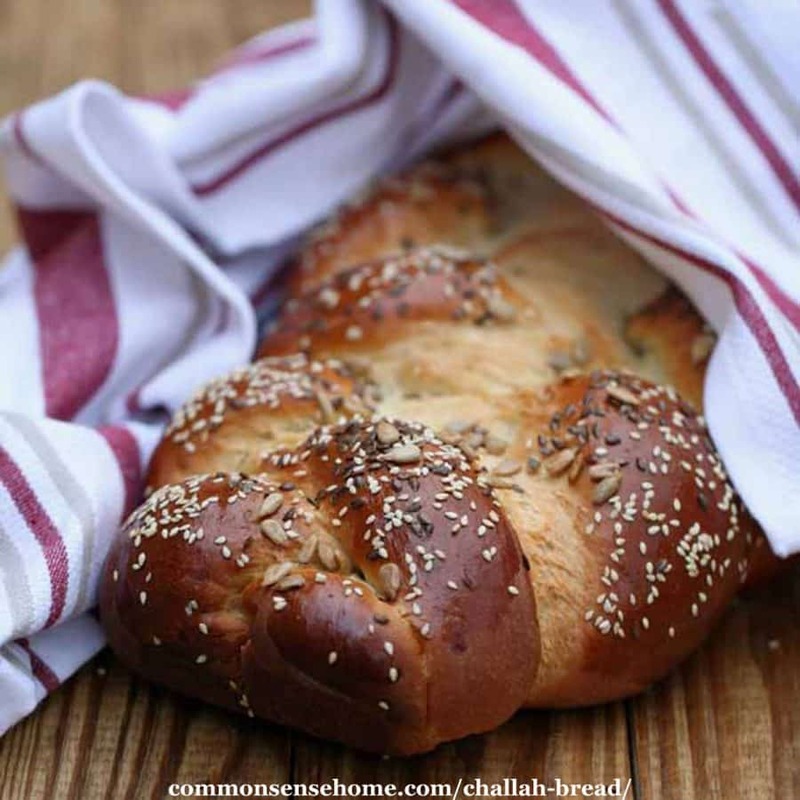 Update – New Recipes – Betty's Buttermilk Rye Bread – Light rye bread with makes a great sandwich bread with a twist, and Challah Bread from Lady Lee's Homestead. 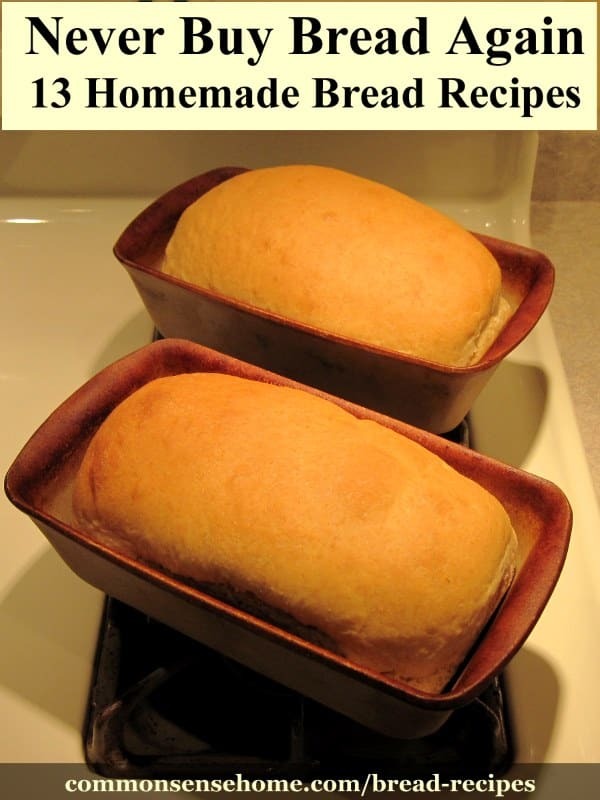 Still not getting the results you'd like with homemade bread? 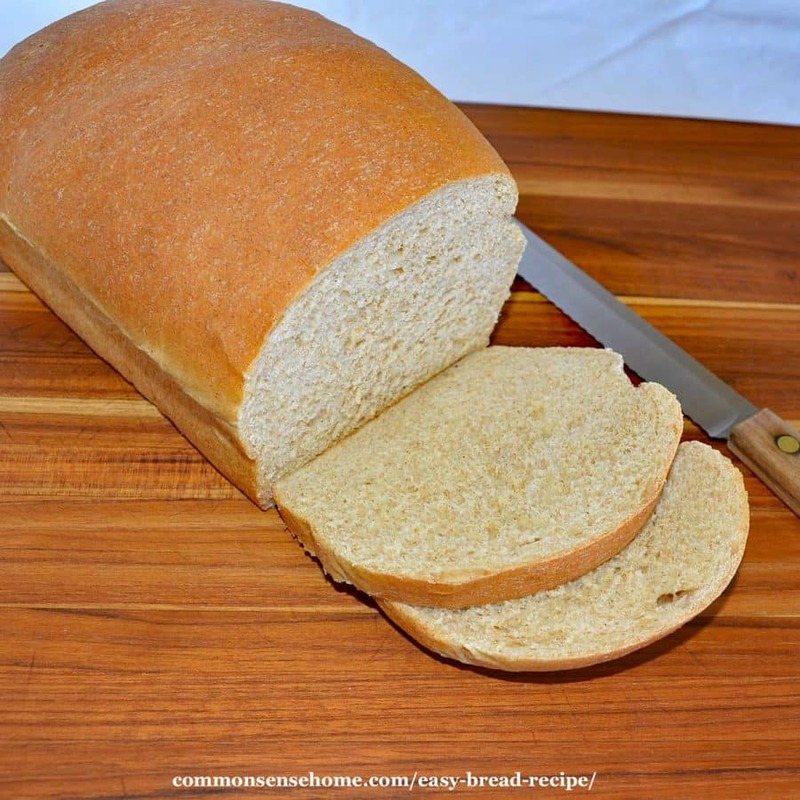 Check out the post, “Troubleshooting Tips to Help You Bake the Perfect Loaf of Bread“. 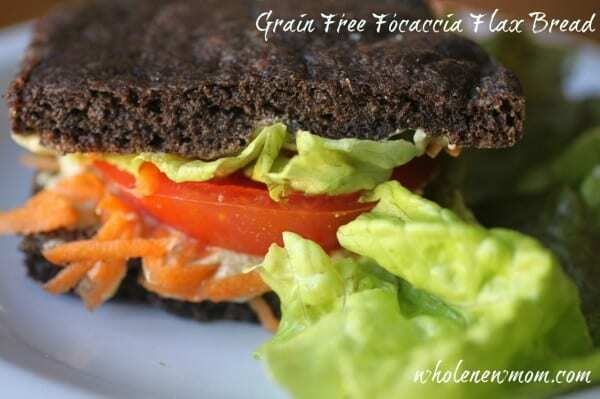 Starlene from GAPS Diet Journey has a new e-book that includes a coconut flour sandwich bread called “Beyond Grain and Dairy” (affiliate link). The book contains 113 recipes that are gluten and dairy free. The recipe is also featured in her e-book, “Baking with Coconut Flour“, which contains not only recipes that use coconut flour, but a step by step formula to convert standard recipes to coconut flour recipes. If you need even more recipes, Amazon has an always amazing collection of recipe books. You may also enjoy the Recipes page, which lists all the recipes on the website. Note: If you are here via the “Top 50 Preparedness Sites” posts, please visit the Preparedness page for an overview of many of our preparedness posts. Great collection of recipes! Thanks!!! Awesome! Thanks for all the GF options! I love making bread. Thank you for these recipes. Can’t wait to try them. Do you have any low carb bread recipes? Debby – the gluten free bread options, especially those made with coconut flour and coconut butter, as likely to be much lower in carbs. The sprouted breads also seem to be lower in carbs. Yes, sprouted grain digests more like a vegetable. I absolutely enjoyed this post. I can definitely save a lot by making my own french bread instead of going to Subway. ITALIAN (WHITE) BREAD Enriched wheat flour (wheat flour, barley malt, niacin, iron, thiamin mononitrate, riboflavin, folic acid), water, yeast, sugar, contains 2% or less of the following: soybean oil, wheat gluten, salt, dough conditioners (DATEM, sodium stearoyl lactylate, ascorbic acid, potassium iodate, azodicarbonamide), yeast nutrients (calcium carbonate, calcium sulfate, ammonium sulfate), wheat protein isolate, yeast extract, vitamin D2, natural flavor, enzymes. Bread doesn’t need to be so complicated. if you read most bread ingredients most have the same ingredients as subway bread. Really great post! I’ve shared with my readers, and am reminded to post my peasant bread recipe on my page sometime soon…I’d forgotten about it! Thanks for the assortment of recipes. Could you perhaps help us find a good multi-grain recipe similar to the sprouted whole wheat recipe. I know it’s important to know the right amount of each type. For instance, too much soy can be really hard, barley does something else, etc. Thanks! Can you tell me how to best store breads? Can I refrigerate/freeze them? How long will they last, etc… Thank you so much for adding gluten free recipes!! Great post! Storing bread in the refrigerator is not recommended. Fridges tend to be more moist, and the temperature range is not good for maintaining the flavor of the bread. Fridge storage often encourages mold and off flavors. Most of the time I store my bread in a plastic bag or container on the counter, but if you like a firm crust you can just keep it out with the cut side down on a cutting board, or wrapped in a towel. Bread boxes or bins are nice, too, but they will allow the bread to dry out more. This is good for maintaining air circulation and keeping the bread from molding, but it will get chewier. We use up fresh bread within a week or so. If I know we will not be able to finish a loaf in time, I freeze a portion of it. I often make several loaves at one time, keep one out and freeze the rest. Don’t slice bread fresh out of the oven. It should rest for 10-15 minutes before serving, just like meat. This traps the moisture inside the bread, and allows it to completely set up and finish baking. Of course, if you’ve got a group hovering by the oven and the whole loaf is going to disappear right away, this is a moot point. 🙂 Also, don’t slice bread until you’re ready to eat it. Unsliced bread will store much better. When storing breads in freezer, make sure the bread is well wrapped so it retains moisture. When you are ready to eat the frozen bread, it’s important to take the bread out and allow it to thaw completely before unwrapping. This will allow the loaf to reabsorb any of the moisture that’s migrated out to the wrapping. Let the bread come to room temperature, then pop in the oven for 5-10 minutes at 350 degrees for a warm revitalized loaf. Avoid storing bread in the refrigerator, David cautions. Changes in the alignment of the starch molecules are what cause bread to go stale. These molecules change most rapidly at the temperature range of the refrigerator (just above freezing). When you reheat bread, it actually changes the starch molecules back, but this also means they can go stale more quickly afterward. So try to eat your reheated breads within an hour or two. For most of the recipes, yes, a stove is typically used, but I know people who get creative and use Dutch ovens over campfires or make fry bread. ok…good..how does one do that??? I don’t have a stove but do have a dutch oven! I have found bread is like soup; very forgiving. With the basics of flour, liquid and leavening, you can play around. Im impatient and use more yeast to rise faster, dont rise twice, and if I use low/no gluten flours like buckwheat, rice, etc, I add gluten. I do knead it a lot though. I also like heavy breads so use teff, garbanzo, wheat and oat bran, buckwheat, rye, oat and others. This makes a heavier crust. I put them into a plastic bag while hot or warm making sure its right on the bread. Let it sit overnight to cool and the crust is still thick but not hard. I then freeze them for months depending on how many loaves I make. Heavy breads, cook slower. When bread sounds hollow when thumped, its done. Glass pans are different from metal. I line all my pans with parchment paper that I reuse over and over, and peel off while hot. Big sheet for the middle, two smaller ones for each end. My favorite bread pans are pyrex casserole dishes. I’m not sure you can get exactly what I have; but they’re rectanglish. I think they’re 2 or 2.5 quarts or liters? It makes about a 1 1/2 to 2 pound loaf, wide enough for a good size sandwich. I have modified my recipes to make the loaves a bit larger. I also use corning glass bread pans. I like the way they hold heat after they’re out of the oven. Personal preference perhaps. I’ve got one pyrex loaf pan and two stoneware pans now. All work pretty well. I was wondering if you could substitute vital wheat gluten for the dough enhancer? And if not, does the ginger taste come through in the bread? I was looking at your homemade version. I’ve never used dough enhancer, just VWG, so am just curious. I’d love to give your recipe a try! Looks yummy!! FYI the sprouted wheat flour we buy is by One Degree and they have a very nice line of products. We get ours through our co-op for just about $1/pound so it’s very reasonable. Thanks so much for your help!! Judy – are you talking about the 100% whole wheat recipe? That one’s from a friend of mine, so you would need to swing by her site and ask directly, as I haven’t yet tried her recipe. Thanks for posting, these breads do look delicious. Cant wait trying my next batch gf batch 🙂 ThanksAgain!! My favorite recipe is Oatmeal Bread. I use the old (1950’s) Better Homes & Garden recipe, and add a bit of mashed potatoes to make it stay fresh longer. The recipe has molasses and is sooo good. I am looking for a good Squaw Bread recipe. I saw one once, and misplaced it or threw it away. Never was able to make it. I believe it had some rye, cornmeal, and some molasses in it. If any of your readers makes a good Squaw Bread, I’d be so happy if they’d share their recipe! I’ve got a couple of historical cookbooks. I’ll have to look through those and see if I come up with anything. 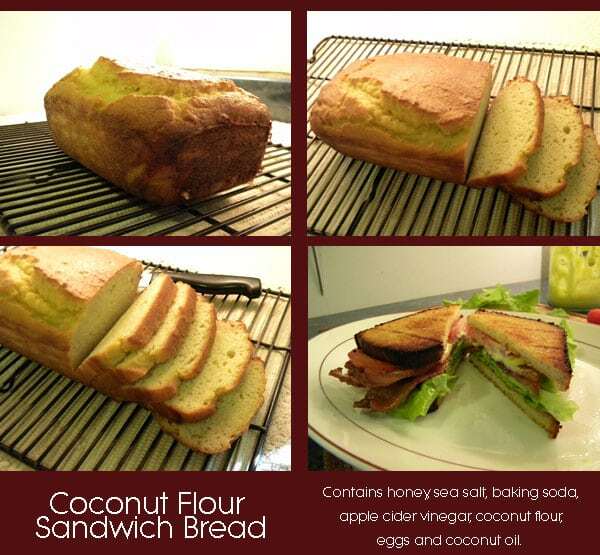 can you send me a recipe for sourdough coconut flour bread? Thank you very much. I’m sorry, but nut flours and coconut flour will not ferment (they are too high in protein and not high enough in the sugars that feed the yeast). To the best of my knowledge, a coconut flour only sourdough bread recipe does not exist. You could probably adapt a coconut flour blend for use with the kombucha sourdough starter recipe. Any pretzel bread recipes? Chris LOVES pretzel bread! I would LOVE to try the Sour Dough recipe…I love sour dough! Thanks for being on Google now Laurie! Miss you guys, your boys look soo big!!! does anyone have a recipe for English muffin bread???. It is so good & easy, but years since I have made it. Are you talking bread with the texture of an English muffin? This is not something I’m familiar with, but I can be on the watch for one. i watched the episode and it looked good enough…. Would love to try .But when I leave this page want be able to retrieve.If posible would like more information sent to my e-mail address. I’m not sure I understand the question. You can use the Print Friendly button at the bottom of the posts to print out the recipes on my site, or if you are on Pinterest you can Pin them for later. Do u have a plain oatmeal bread without any other ingredients? Do you mean oatmeal or oat flour? I don’t currently have either, but I can watch for such a thing. Do you have any suggestions on how to make these Yeast FREE? Thanks! Cindy, I do have several quick bread recipes (those leavened with baking soda and/or baking powder instead of yeast) on the recipes page – see Quick Breads. Can I use a bread machine? I have arthritis in my fingers. Yes, I mix most of these via machine, and then just shape and bake in the oven. If one of the recipes matches the capacity of your machine, you should be able to finish the whole thing in the machine. You really missed one .. Mesquite Bread. Mesquite flour has the unique quality of having no gluten, and being naturally sweet and the sweet being a sweet that diabetics can have. The flour is actually made from the pods as the seeds are inedible. The flour is similar to graham in texture and smell and taste. The pods can also make a naturally sweet lemonade by steeping them in hot water. While the flour has no gluten it won’t rise but by mixing it with half white flour or whole wheat you can get a half raised product. Naturally the Indians ate a bread similar to pita in nature. It has a wonderful taste and recipes can be found on line. http://www.desertusa.com/lil/mesquite.html I believe it also has links to purchasing mesquite flour. I’ve heard of it, but it’s not a product I can easily get around here so I haven’t baked with it yet. Thanks for sharing your experience. where are the 13 bread recipes? When i click on the picture it just opens another picture? Just click on the name of the bread right below each photo. Thanks for the plethora of bread recipes! I’ve been wanting to try some new ones, and it’s so kind of you to post these all in one place! Wow a great link! Thanks! I need to make bread for the week because I forgot to buy some from Whole Foods. Cheaper to make anyway! I wish these were like in pdf form so when we are off grid and off internet we could still have them handy. There’s a PrintFriendly button at the bottom left of each post, or you could cut and paste them into a word processing program. The sandwich beard is linking to a sloppy joe recipe for me. the rest look great though! I use the same recipe for making buns for sloppy joes and making sandwich bread. Just form it into loaves, let rise and bake for around 25-30 minutes. I have no sandwich beards available at this time. I updated the post to make the bread directions a little clearer. Next time I bake I should get some new photos and give the bread its own post. I make a lot of bread. I also make my own bagels. About the bread, if you like wheat bread make it yourself. The flavor is so different and so much better than the wheat bread sold in grocery stores. Absolutely! The boys don’t like to eat bread away from home because it tastes so different. I have recently started making my own bread with organic flour. I love the result! I just took today’s batch out of the oven, and it smells so good! Baking helps keep the house mice and cozy on cold and wet days like today, too. Even if you can only do a little, you are far ahead of those who do nothing. It all adds up. Thank you for the bread recipes. Do you freeze your bread. I would like to start making bread but I don’t have time to make bread every day. Yes, I regularly freeze bread, because I don’t have time to bake every day, either. Most of the time I just pop a cooled loaf in a gallon ziplock bag, squeeze the air out and pop it in the freezer. Never put them in the freezer warm. You’ll get condensation when you thaw and soggy bread. Great recipes Laurie! I, too, bake my own bread and have been doing so for two years now. Nothing smells better than fresh baked bread in the house. I’ve made basic white and wheat bread, buckwheat bread, Irish Soda Bread and my favorite dutch oven bread that you don’t have to knead; just mix up, cover with plastic wrap and let rise overnight and the next morning flour your board, roll the dough from the bowl onto the board, shape and set inside the hot dutch oven and bake with lid on for 20 min. and then take lid off and bake for another 10 minutes. Great bread and so easy! I haven’t tried any of the no-knead recipes yet, but I have other friends who swear by them, too. and really hope that you will give it a view and perhaps comment or follow it. I really love your blog. I learn so much and I am greatful. This bread post is awesome. Thank you very much. I am just starting to bake breads and this helps so much. Thank you for your kind words, Tara. I was thinking about doing a post specifically devoted to bread baking tips. Would that be helpful to you? Thank you for consolidating all these recipes. I have made 2 out of 13…working on the rest! This will be my next adventure. We have to find an alternative to Udi’s! I’ve heard that white flour and whole wheat are very detrimental to health. 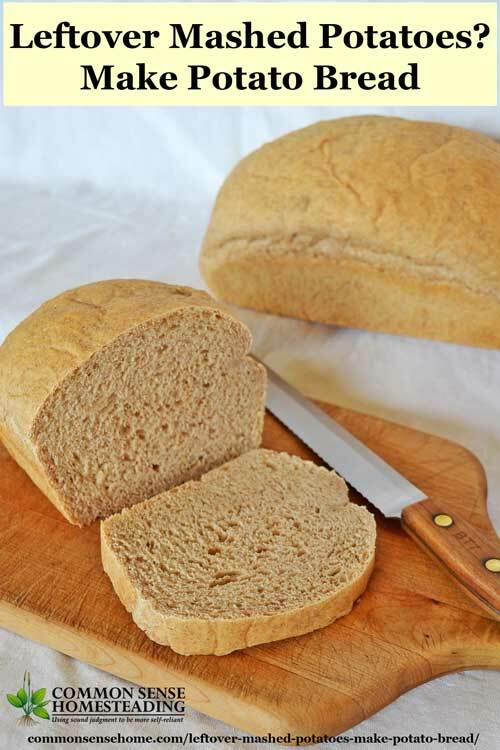 Do you have any bread recipes that don’t use white and whole wheat flour? Yes, the gluten free recipes in the second half of the list are wheat free. I thought you had the Best Ever Bread recipe, but can’t find it now. Did you post the link? What you see is what’s available currently on my site. I didn’t post anything specifically with that title. How come the photos of “potato bread made with leftover patatoes” and “Betty’s buttermilk rye bread” are the same, on the same countertop and with the same knife beside? They seem to be the same bread even! I’d like to share a tip for baking bread as well. I bake my bread (750 g bread flour (called nbr 55 in Europe), 450g tepid water, 23g fresh yeast, pinch of sugar, 2 coffee spoons of salt, start in a cold oven-bake 1 hour) in a heavy iron cast cooking pot . To me, after a lot of experimenting, this is the best way to cook bread. The moisture stays inside the crockpot, the crust is nice and crispy and it is well cooked. The photos of the bread look similar because I take all my own photos in my house on my counter tops and cutting boards, and I have one good bread knife that I use all the time. Whole wheat flour and rye flour are very similar in color, thus the breads are similar in color. If you look closely at the rye bread, you will see small dark flecks in the loaf. These are caraway seeds. The rye bread is not a pumpernickel rye, would would have coffee or cocoa powder added for extra color. If you are looking for a website will all photos professionally styled and different props for every photo, this is probably not the right website for you. Hi Laurie, thanks for putting the pin of this post in the Pinterest Game. Good Luck and we hope to see more of your pins on Friday. Only one light rye recipe, as I’m the only one in the house who likes rye and I am gluten free right now. Without having to read all of the recipes entirely, are any of these sugar free? I have to buy sugar free bread and it is expensive. Would be so nice to make my own. Thanx in advance for your reply. What, specifically, are you looking for in a “sugar free” bread? If you eliminate sugar but still use white flour, that bread’s going to have a high glycemic index. 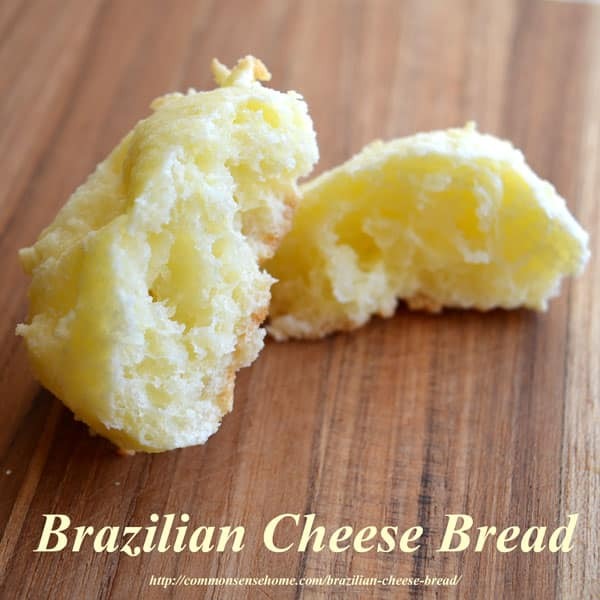 If you’re looking for a bread with a lower glycemic index, try some of the gluten free options (but not the Brazilian cheese bread, as that uses tapioca flour). Does anyone make Salt Rising Bread anymore ? I used to be able to buy it 40 plus yes ago when I lived in California. It’s still out there, but I haven’t tried it yet. Some of them, as noted in specific recipes. The sandwich bread, buttermilk rye and potato bread recipes work well in a bread machine. we almost never buy white bread. we buy breads with all kinds of seeds and grains. Seems it is too hard to have healthy breads made at home. 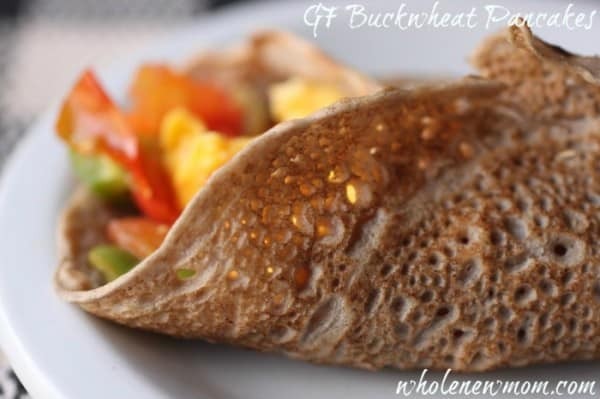 You could use whole wheat flour in any of these recipes. (I use an organic white wheat, so the color of the loaves is fairly light.) If you like seeds or oatmeal in your bread, you can mix in a handful along with the flour. Not tough at all. 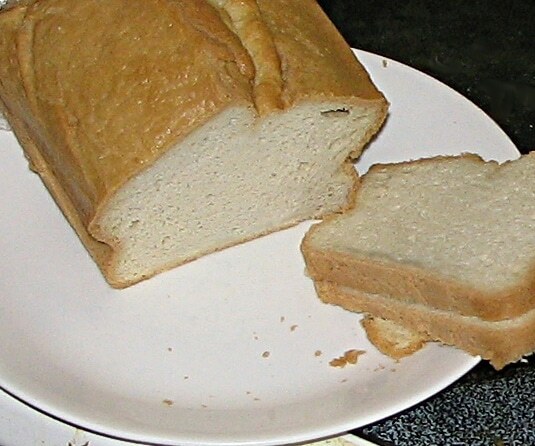 Homemade bread has a short ingredient list with no artificial anything.